The value to customer is of emotional kind and not economical. The perceived value to the customer is of private kind and is different for each customer. For instance, the value of the ceremony to someone who bought Lexus is much more than the value to someone who bought a Corolla. That said, the value of the blessing to a first time car buyer or someone who bought the maximum they can afford (even if it were a Corolla) is high. Price discrimination is not about squeezing every bit of consumer surplus from every customer (in one model it is). It is about getting customers to willingly pay the price they can pay and still feel happy about it. A regular reader of this blog sends an example of price discrimination at the altar of god done right. This comes to us all the way from Notre Dame cathedral in Paris. As one walks along the caverns of the cathedral one sees near every niche a bunch of votive candles lit. Next to the lit candles are stacks of new ones that you can pick up and light as offering. The price? In reality it is €0. But it is more nuanced than that. The set price is 0 but you are encouraged to leave donations. This is where the price discrimination done right comes in. 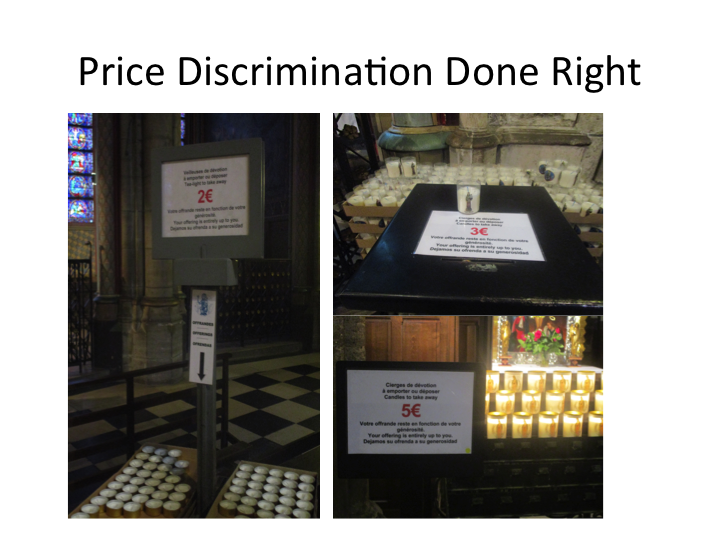 A simple method would have been to offer just one type of candle and ask visitors to pay what what they want and expect them to pay their true value of lighting a votive candle. What the good folks at Notre Dame have done is a nicer and better form of pricing. They offer the visitors not one candle type but three candles types – a very basic small sized version, a middle version and a highly decorative large version. The price? These are free remember? There are no prices but only suggestions, setting an anchor to donate and offering them three different options. Price discrimination, despite its bad rap, is a good thing for all.